Celebrate Norfolk’s flagship event in Norwich on June 11 and 12 has been broadening its horizons while Celebrate has also spread its wings to King’s Lynn and the Royal Norfolk Show. Keith Morris reports. 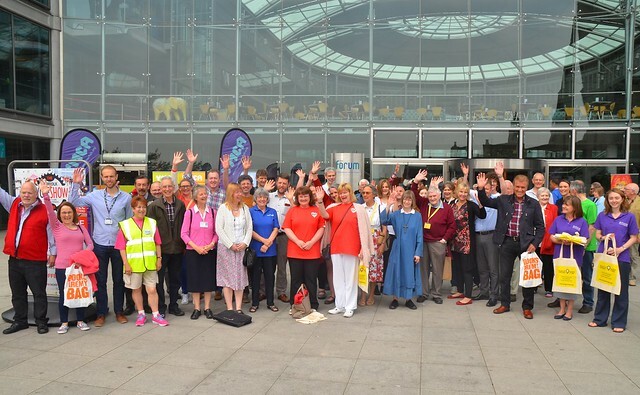 Two dozen Christian organisations demonstrated and celebrated the Christian community in action in a major exhibition inside and outside the Forum in Norwich city centre on Saturday June 11. Outside on Millennium Plain, there was drama from Saltmine Theatre Company and music from a combined 40-strong Norwich churches choir and the Norwich YFC Tracks performance zone. Deputy town crier Bob Lloyd, in recognition of the Queen’s birthday on the same day, proclaimed: “We rejoice with all loyal subjects throughout our nation and Commonwealth, in wishing Her Majesty Queen Elizabeth II, joyful and happy celebrations of her 90th birthday. We recognise Her Majesty’s influence and impact on all our lives and thank God for her years of faithful and humble service to her loyal subjects. Let us all join together in proclaiming ‘God save the Queen’. Marie Reavey, branch leader for the Norfolk Christian Police Association, said working in partnership with churches brought huge benefit to her job. Rebekah Manfield is a church and tenant empowerment worker for Hope into Action, which provides accommodation for homeless people, with five houses in Norwich and two more on the way. On Sunday June 12, a free picnic for volunteers of Christian projects across Norfolk was held at the Narthex at St John the Baptist Catholic Cathedral in Norwich, followed by the Celebrate closing service in the Cathedral itself with testimonies from exhibitors. Read a story about Celebrate King's Lynn.